Maersk Training has announced it has launched five new Global Wind Organization (GWO) Basic Safety Training Refresher (BSTR) courses. The new courses cover manual handling, first aid, fire awareness, work at height and sea survival and are obligatory for all GWO trained personnel who wish to continue working in the Wind industry after their initial certification has expired. Maersk Training was the U.K.’s first training provider to achieve accreditation for all five GWO modules in 2012. 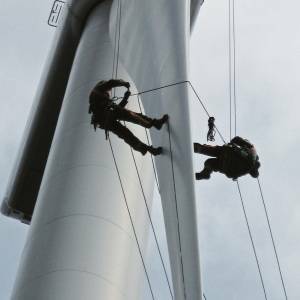 The standards for Basic Safety Training (BST) have been developed by the GWO, an association of wind turbine owners and manufacturers, with the aim of supporting an injury-free work environment, through the establishment of recognizable BST in the wind industry. The safety standards are based on risk assessments and factual incident statistics within the industry related to the installation, service and maintenance of wind turbines. If the GWO Refresher courses are taken prior to the expiry of the full certificate, they can be completed across three days, with one additional day if the GWO Sea Survival Refresher is required, compared to doing the full GWO courses again which are 6.5 days. GWO certificates last for two years, with the exception of Sea Survival which is four years duration. Anyone who attended a GWO course in 2012 is now due for renewal. The GWO Refresher package is scheduled to run each week from May 27, 2014 onwards.